result in better valvetrain control and ultimately more power! 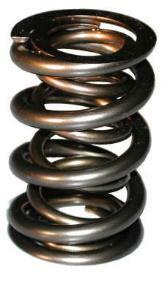 unprecedented number of runs on a single set of springs! load allowing performance at the end of a race equal to that at the start! they are significantly less expensive than the titanium alternatives! a more aggressive camshaft and increase performance even more! develop a proprietary spring for your application. spring surged wildly throwing the valve off the nose of the cam and also allowed it to bounce when it slammed closed. customer was able to select a more aggressive camshaft and increase performance even more! 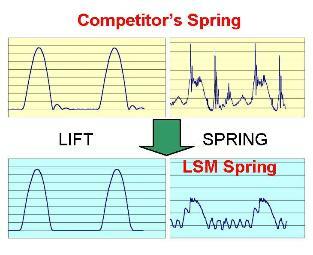 springs should be used when the ultimate limits for cam profile, and lift need to be met. 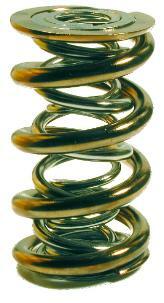 material outperforms any valve spring material that we’ve ever tested. ever produced. This spring takes spring technology to the next level. Mod and other high performance engines. Sprint Car, or Winston Cup. 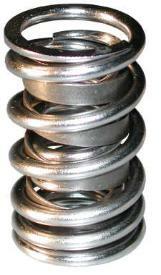 This spring used for budget applications from high performance street to drag race. Good for applications of up to .850” lift. spring is ideal for any hydraulic street or mild solid lifter application. providing higher load and lift capability.